Each year, more than 4,000 Americans die and nearly 25,000 are injured in home fires. Protecting your home and family from house fires is a continuous process, not a one time event. 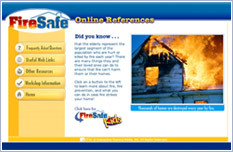 The FireSafe CD-ROM provides video presentations and hands-on activities that will reduce users’ risk of starting a house fire and increase their chances of surviving one. In less than 30 seconds, a small flame can grow into a major fire, filling a house with smoke and engulfing it in flames. Prevention and early detection are vital. FireSafe provides information to help you protect your family and your home from fire: how to install and maintain smoke alarms, how to recognize and correct fire hazards, how to develop an escape plan, and what to do if fire strikes. By installing and maintaining smoke alarms, identifying and fixing fire dangers, developing a home escape plan, and knowing what to do if a fire should occur viewers, and their homes will be better protected from house fires. Watch part of a video presentation from FireSafe. 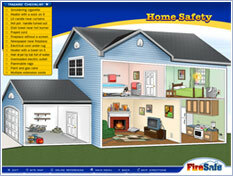 The FireSafe CD-ROM links to a website that offers additional fire safety resources. 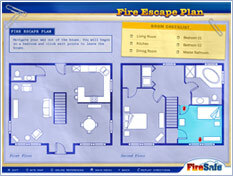 There's also a CD-ROM called FireSafe Kids with activities that teach school-age children fire safety and prevention techniques.